This Friday we have an exciting Carnival Games for everyone on campus. 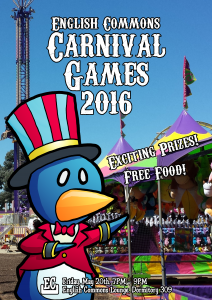 We are hosting our 2nd annual Carnival Games, which is an authentic funfair fare! We have door prizes, snacks, drinks, and wacky games for everyone. The English Commons is a place where UNISTARS can make new friends, relax, and improve your communication skills. We have activities for everyone!!! We encourage you to come and have a memorable time.